Featuring a more symmetrical last shape, the Zephyr is ideal for those who find highly asymmetric shapes uncomfortable. 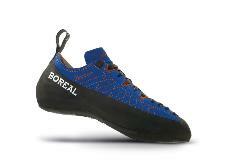 A board lasted construction (a construction method normally associated with high quality trekking boots) provides excellent support and durability, and allows the use of small edges. A canvas lining to the heel and lateral anti-stretch stitching on the high quality split leather upper provides comfort and retains shape over time. Full length lacing ensures a precise fit. Finally, the sticky and durable FS Quattro™ rubber blends edging support with great friction. Zephyr is close fitting, comfortable, precise and durable. It is ideally suited to long routes and classic climbs. 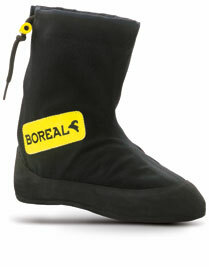 The Boreal Ninja Invernal Guetre is designed for highly technical climbs in cold conditions or at high altitude. Warm and waterproof, but also sensitive and sticky, Ninja Invernal Guetre is ideal for some of the hardest climbs in the most serious situations.